If a yard is a canvas, then applying “paint” – lush green grass, multicolored flower beds, mosaic stepping stones – is easier for most if the canvas is flat. While landscape architects can easily visualize terraces or a waterfall, homeowners limited by inexperience or budget see nothing but an uphill battle. 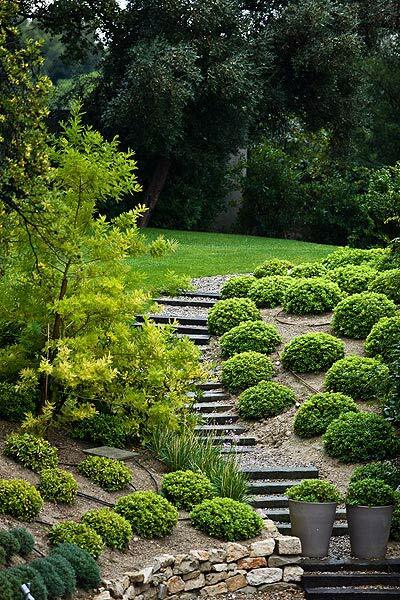 But there are lots of ways to sculpt and color a contoured yard, with or without a landscape designer’s assistance. If a functional rather than frilly space is a must, hardscaping the slope with a series of connected decks will create different zones for entertaining and relaxing. Natural stone, brick or wood can be used to tie the hardscaping in as an architectural element of the home. Certain building projects may require an engineer’s stamp or a permit, along with an understanding of natural forces such as hydrostatic pressure. “If a slope is not planted or stabilized properly, it can present a hazard in wet weather or to the gardener tasked with maintenance,” Silver says. Plants with dense, strong roots that help hold the soil perform best on slopes. Staggering rows of such plants also safeguards against erosion.